This is an embedded video (we uploaded it to the site, it resides on the server). 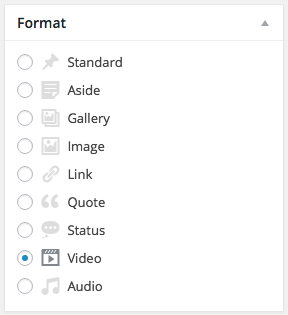 Adding a video in WordPress is as simple as uploading a photo. You can then simply embed it in your post. 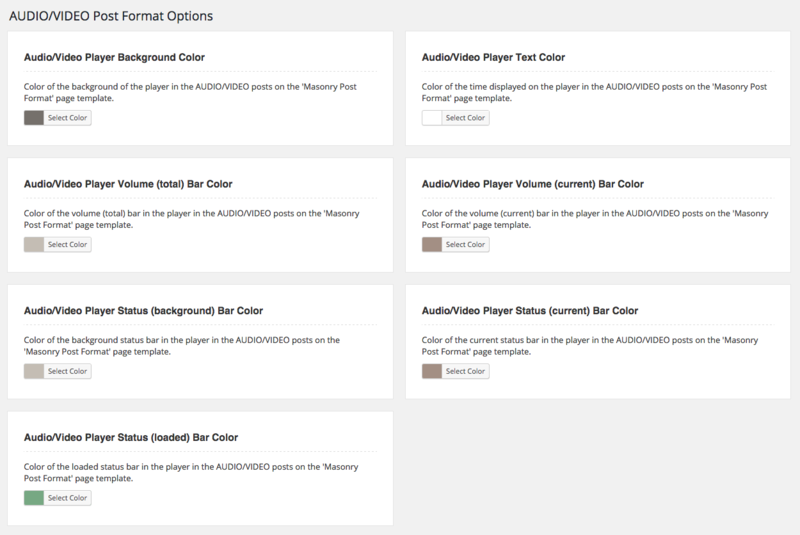 Audio/Video Player Background Color – Color of the background of the player in the AUDIO/VIDEO posts on the ‘Masonry Post Format’ page template. Audio/Video Player Text Color – Color of the time displayed on the player in the AUDIO/VIDEO posts on the ‘Masonry Post Format’ page template. Audio/Video Player Volume (total) Bar Color – Color of the volume (total) bar in the player in the AUDIO/VIDEO posts on the ‘Masonry Post Format’ page template. Audio/Video Player Volume (current) Bar Color – Color of the volume (current) bar in the player in the AUDIO/VIDEO posts on the ‘Masonry Post Format’ page template. Audio/Video Player Status (background) Bar Color – Color of the background status bar in the player in the AUDIO/VIDEO posts on the ‘Masonry Post Format’ page template. Audio/Video Player Status (current) Bar Color – Color of the current status bar in the player in the AUDIO/VIDEO posts on the ‘Masonry Post Format’ page template. Audio/Video Player Status (loaded) Bar Color – Color of the loaded status bar in the player in the AUDIO/VIDEO posts on the ‘Masonry Post Format’ page template. Sticky Post Background Color – Color for the background of the pushpin icon on sticky posts on the ‘Masonry Post Format’ page template. Sticky Post Icon Color – Color for the pushpin icon on sticky posts on the ‘Masonry Post Format’ page template. Background Color – Choose the color that will be used for the background of the post boxes on the ‘Masonry Post Format’ page layout. This does not include headers/links. Border Color – Choose the color that will be used for the 1px border of the post boxes on the ‘Masonry Post Format’ page layout. This does not include headers/links. 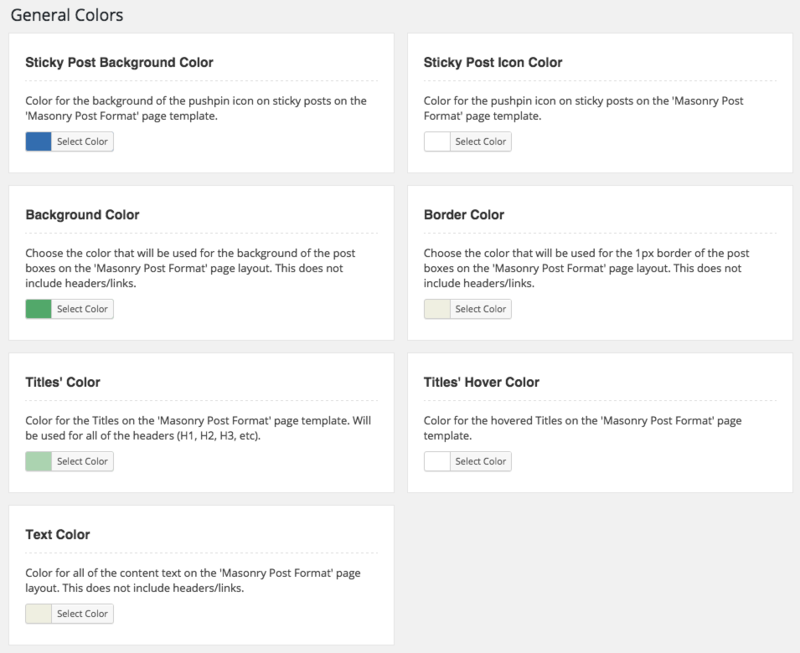 Titles’ Color – Color for the Titles on the ‘Masonry Post Format’ page template. Will be used for all of the headers (H1, H2, H3, etc). Titles’ Hover Color – Color for the hovered Titles on the ‘Masonry Post Format’ page template. 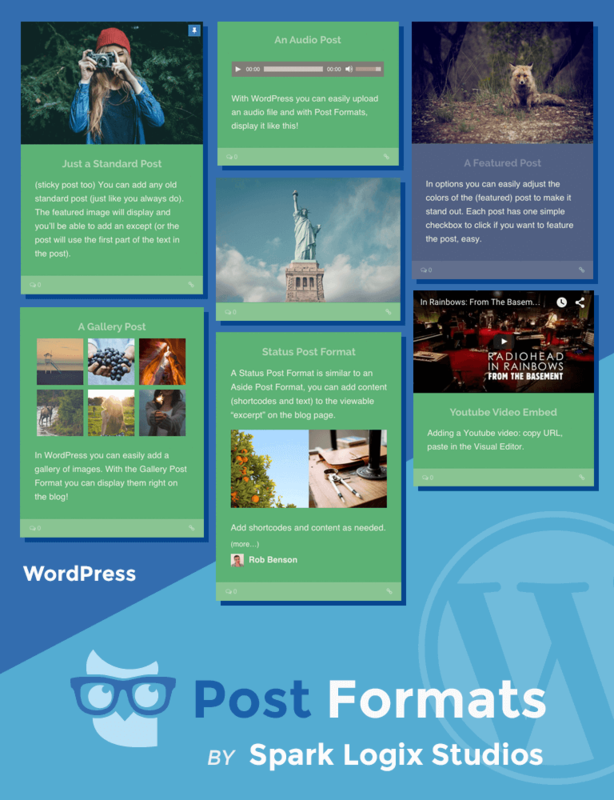 Text Color – Color for all of the content text on the ‘Masonry Post Format’ page layout. This does not include headers/links. Meta Link Color – Color for the linked Meta data on the ‘Masonry Post Format’ page template. 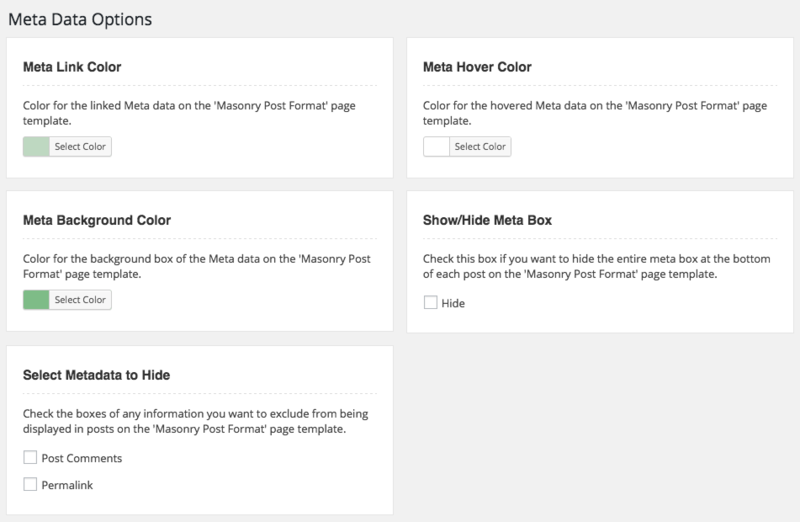 Meta Hover Color – Color for the hovered Meta data on the ‘Masonry Post Format’ page template. Meta Background Color – Color for the background box of the Meta data on the ‘Masonry Post Format’ page template. Show/Hide Meta Box – Check this box if you want to hide the entire meta box at the bottom of each post on the ‘Masonry Post Format’ page template. Select Metadata to Hide – Check the boxes of any information you want to exclude from being displayed in posts on the ‘Masonry Post Format’ page template.